1. Mix the tamarind concentrare, turmeric powder, coriander powder, 1/2 tsp salt and white pepper powder. 2. Combine this with the chicken pieces and place it in a sealed bag. 3. Allow to marinate for 2 hours or preferably overnight in the fridge. 5. Saute the red chillies and onions for 3 to 4 minutes. 8. Once cooled, grind to a coarse paste. 9. Meanwhile, remove the chicken pieces and discard the marinade. 10. Deep fry the marinated chicken pieces in hot oil until golden and crispy. 12. Transfer them to a large bowl and pour the chilli sauce over it. 13. Toss well to coat all the pieces. 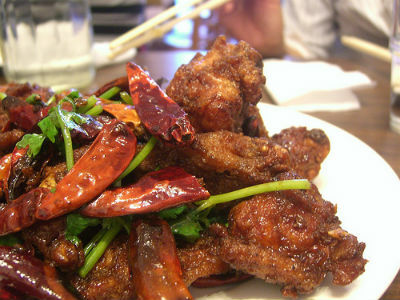 Feel free to comment or share your thoughts on this Chilli-Fried Chicken Recipe from Awesome Cuisine.